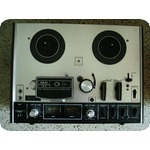 Vintage Akai 4000DS MK-ll Four Track Reel To Reel Recorder Used. Powered unit up and spindles turn, function select switch works, Meters working and internal microphone works. Do not have reels/reel locks to test record function. Right spindle is slightly bent, should not affect functioning. Have downloaded manuals and will include on CD. Sold as is to Continental US only..